Want to gain quality experience in research? If yes, apply for this research assistant position for a study that is looking to explore a feasibility of a clinical trial evaluating effectiveness of pain education on patients with low back pain. 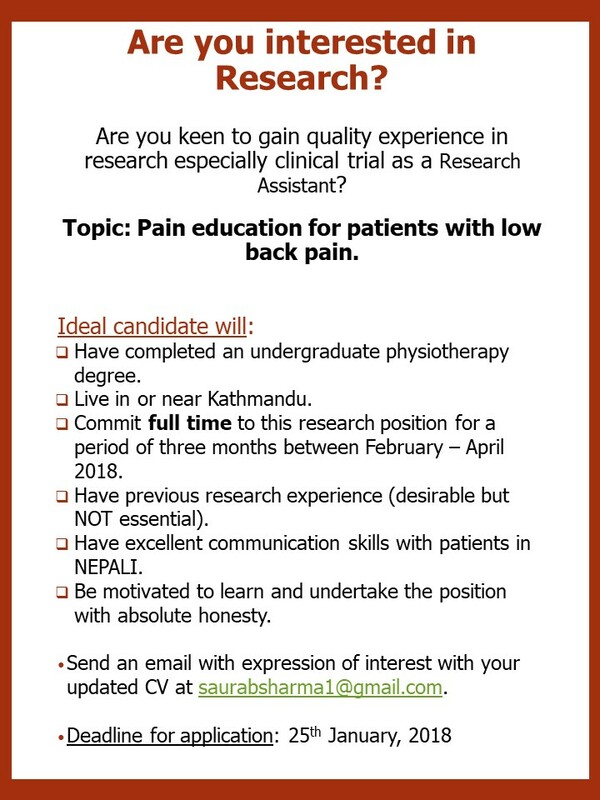 I am seeking for a full time research assistant to work with me in research for the duration mentioned above in a study on low back pain. If you are motivated to learn and do research and meet the following criteria, please apply. 1. Invite patients with low back pain visiting a physiotherapy facility in Kathmandu. 2. Screen the participants for inclusion in the study. 5. Collect data at two time points: baseline and post-treatment at one week follow-up. 6. Maintain documentation of the research data. 7. Enter data into Excel/ SPSS. 8. Follow high research ethics, and have an excellent working and learning environment. 9. Communicate effectively with the research team both verbally and via emails. Strong communication skills in Nepali is an absolute requirement; and excellent skills in communicating via emails is a necessary skill. You will work with Saurab Sharma, who is a PhD candidate at Dunedin School of Medicine, University of Otago, New Zealand, and Assistant Professor at Kathmandu University School of Medical Sciences, Dhulikhel. 1. Emails without subject headings will not be read. 2. In the email, clarify that you meet all the requirements mentioned above. 3. Expression of interest over social media or website will not be considered.